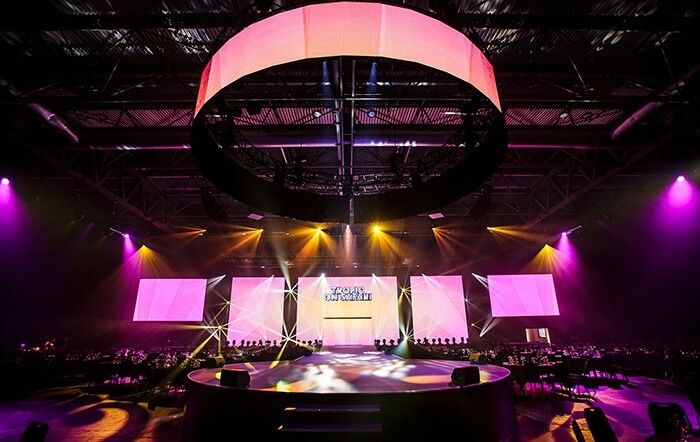 CPL’s project manager Mike Radford working with Lee Gruszeckyj and Karl Johnstone composed a slick, stylish contemporary stage and screen design based on the client’s brief, which utilised over 200 panels of the company’s new ROE CB5 indoor / outdoor LED screen product. It's so new that it had only been delivered to the warehouse the previous day! Three on stage LED screens were flanked by two IMAG screens out to the sides giving an impressive widescreen look. 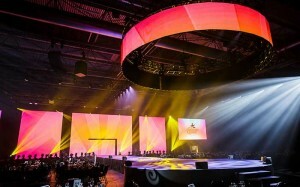 The central screen was made up of two pieces – an arch with a central cut-out panel – which was manually removed for artist entrances and exits for the evening portion of the event when the 2500 audience were entertained by an array of dancers and performers. 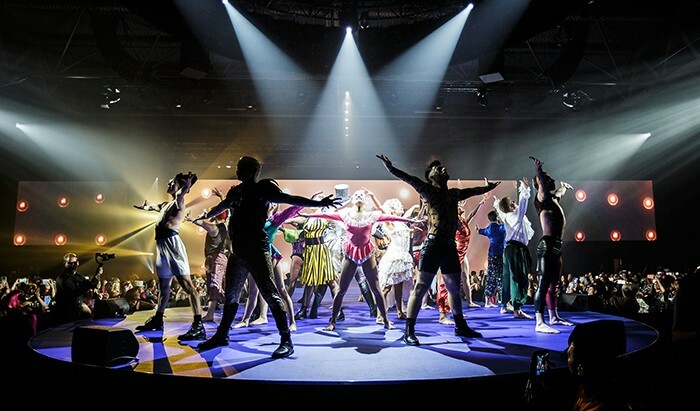 Above the start of the thrust emanating from the front of the stage was a nine-metre diameter circular screen, which brought additional depth, drama and three dimensionality to the space. All the screens were flown as part of CPL’s full technical package which also involved rigging, lighting and audio. CPL supplied one of their disguise 4x4 media servers which was programmed with playback content supplied by the client. 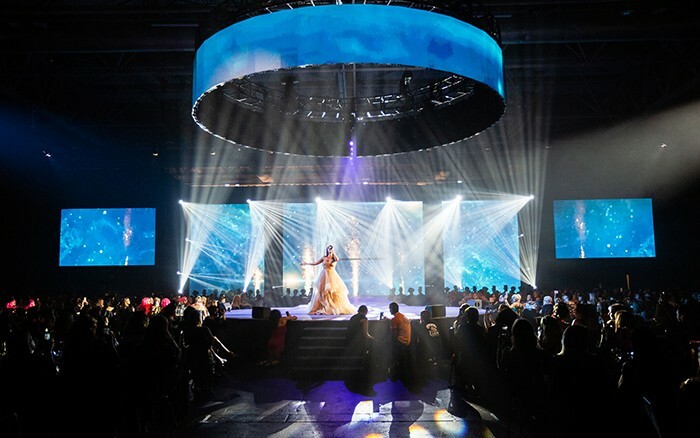 A Barco E2 Event Master processor was used for system processing and screen management. The camera package comprised three Sony HXC-100 cameras, one positioned at FOH with two further down the room, two of which were operated and the third locked-off. Two 20ft. 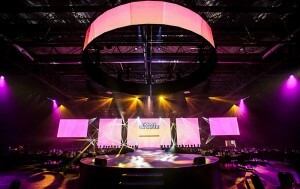 by 11ft delay screens on the back wall were fed with Panasonic 20K projectors rigged in some of the lighting trusses. CPL’s camera director for the event was Karl Johnstone, Lee Moore was the E2 operator, and George Oakey co-ordinated and ran all the PowerPoint presentations which included keynote speeches from business magnet Lord Alan Sugar and Tropic founder Susie Ma, who started the company in 2004 aged 15. The challenge was in getting a substantial amount of equipment in, rigged and ready on time for the one-day event which the CPL team took in its stride. Organising the 40 crew members on the in and the out, and the 22 show crew, ensuring they worked smartly and efficiently was also quite a brain-teaser! The new ROE screen helped the speed of the on site build which was extremely fast for all the video elements due to using the ROE carbon fibre Air Frames (also new) and part of a recent £2 million investment in new video kit. The frames provide a convenient super lightweight all-in-one hanging, stacking and transportation solution designed for maximum efficiency in all production scenarios.